Composed by Werner Egk (1901-1983). This edition: Saddle stitching. Sheet music. Violin-Bibliothek (Violin Library). Piano reduction with solo part. Composed 1928. 64 pages. Duration 24'. Schott Music #VLB99. 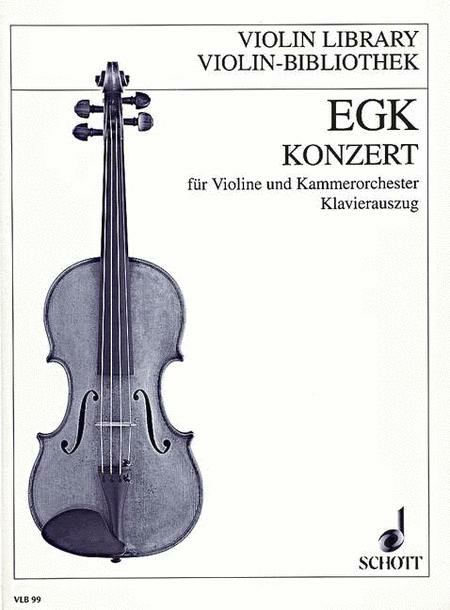 Published by Schott Music (SD.49012378). The Violin Concerto, written in 1928, is one of Egk's most significant instrumental works. It is indicative of the contemporary climate of innovation as reflected in the development of new genres for chamber orchestra, ensembles and soloists, as for example in Hindemith's chamber music pieces, Weill's Concerto for Violin and Woodwind, Berg's Chamber Concerto, and the Concerto and Capriccio by Stravinsky.